Early on in her career, Ana Castellanos became determined to climb the corporate ladder in the hospitality industry—a feat that, at the time, was unprecedented for a Latina. 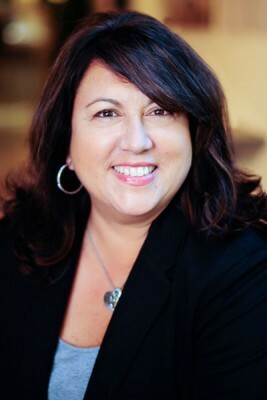 Last year, Castellanos achieved her lifelong career goal; she was named VP and chief HR officer for Oakwood Worldwide. Ana Castellanos describes her upbringing as “very, very Catholic in a Mexican household.” She had protective parents and a close-knit family. Her first job was working in her mother’s office typing payroll checks. So when she was in her junior year at Loyola Marymount University, she decided it was time to cut the apron strings, and she answered an ad for a front-desk clerk at a local hotel. “I interviewed and then told my parents about it, and that’s when I got the comment, ‘No, you can’t work in the hotel business,’” Castellanos recalls. Their hesitation was likely the result of the years they spent putting in long hours and earning low wages in the hotel industry earlier in their lives, when her mother worked in housekeeping and her father was a room-service waiter. The parental pushback didn’t stop Castellanos, though. She took the job, and loved it. “I enjoyed the customer service aspect of it,” Castellanos says. Her previous positions hadn’t afforded her any sort of customer contact, but she quickly learned that she not only liked working with customers, she was good at it. She also had an edge: “The fact that I spoke Spanish was extremely helpful in the hotel business in Los Angeles,” Castellanos explains. But an entirely different transatlantic opportunity soon beckoned, and her career in hospitality would have to wait. A chance to study abroad came up only a few months after she had begun working at the hotel. Castellanos convinced her parents to let her live in Madrid for six months (“I never thought they’d go for it!”). She enjoyed her time there, but there were some eye-opening moments. “I didn’t realize I didn’t speak ‘proper’ Spanish,” she says, explaining that her Mexican Spanish quickly distinguished her from the Spaniards with their Castilian dialect. “The minute I opened my mouth they knew where I was from!” she says with a laugh. The experience was enlightening as well as fun, and Castellanos says it’s one she’ll never forget. The hotel had agreed to hold Castellanos’s job while she was overseas, and upon graduating from college, she knew that hospitality was where she was supposed to be. Never one to set humdrum goals, Castellanos decided early in her career that she was going to be the first female general manager in the hotel business, and she was determined to make it happen. “In hospitality, especially in Los Angeles, you saw Latinas in housekeeping, in particular executive housekeepers, because their language skills were valuable,” Castellanos says. There were also a handful of Latinas working in front-office operations, but rarely were they occupying other positions. With a foot in the industry door and a college degree in hand, Castellanos was determined to get where she wanted to go. Sales is where extroverts land, and Castellanos is most assuredly an extrovert. “But the whole quota thing?” she muses, after recalling a brief stint in sales at a big hotel in Florida. “It was not for me.” Instead, she decided that guest relations was more her speed. Returning to California from the East Coast, Castellanos’s new hotel general manager was the first to key in to her real sweet spot. “I showed up wanting to continue my work in front-office operations, and he said, ‘I don’t think so,’” Castellanos recalls. When he told her that he wanted her to work instead in personnel, her reaction was emphatic. “Those are the people that fire people!” she recalls thinking. When she resisted, the general manager cajoled her into giving the position a six-month trial. “He saw something in me at the time that he thought would be excellent in employee relations, versus guest relations,” Castellanos explains. She realizes now that the special something wasn’t just her business sense and welcoming, approachable personality—her language skills were what sealed the deal. “He needed a bilingual speaker, because the director of personnel at the time did not speak a bit of Spanish,” Castellanos says. She started as a recruiter at the Santa Clara Marriott Hotel in Santa Clara, California, and has been in love with HR ever since. “With employee relations, you can actually make longer-lasting relations with people, which is what I really enjoy,” Castellanos says. After a quick succession of positions and hotel brands that helped propel her forward, she says she was a director of personnel for a Hyatt location in Hollywood when DoubleTree Hotels recruited her. “I started out there as a director of an individual hotel, and I left the company being a corporate regional director and also overseeing the training function,” Castellanos says. Training has turned out to be one of her core strengths, and even though her team at Oakwood Worldwide has a full training department on the roster, she still conducts training simply because she enjoys it. But it hasn’t always been smooth sailing. Castellanos, by now a business leader and a powerhouse of energy and enthusiasm, hit some bumps after 9/11. “I was living back East, and I lost my job—as a lot of people did—and really struggled looking for work for a couple of years,” she says. Contract work in the casinos in Detroit (a sector that didn’t lose much business during that time) followed, and Castellanos found herself commuting between Connecticut and Detroit, once again determined to do whatever it took. It was a good job that paid well, and Castellanos says it was the perfect opportunity just when she needed it. In 2002, she returned to her hometown of Los Angeles and joined the Bloomingdale’s division of Federated Department Stores as the regional head of HR. “Retail has many similarities to hospitality with its focus on customer service,” Castellanos says. “And I loved the idea of learning a new industry.” Less than three years later, Oakwood Worldwide recruited her for the job of vice president of HR, bringing her back into the hospitality fold. “We’re not hotels, but we’re corporate housing and furnished apartments, so it’s very similar,” Castellanos says. She’s happy to be home in the South Bay area of LA, near her parents and doing exactly what she loves.